Our Fine Dining menu, gives you a big city atmosphere with small town prices. 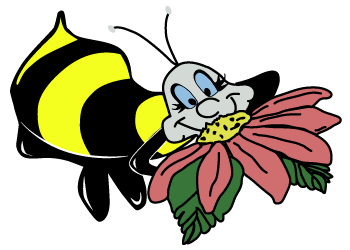 Queen Bee’s offers an amazing atmosphere for any size function. We are the perfect choice for weddings, anniversaries, banquets and special events. With seating for up to 500 guests, we can handle nearly any size event. With our fine dining selections, professional staff and attention to every detail, you can be confident that you and your guests will have a great time and a great experience. Enjoy Broasted chicken Buffet with all the fixing every Monday night at 5 p.m.
Friday Night (During Lent): All you can eat Fish Fry with full salad bar. 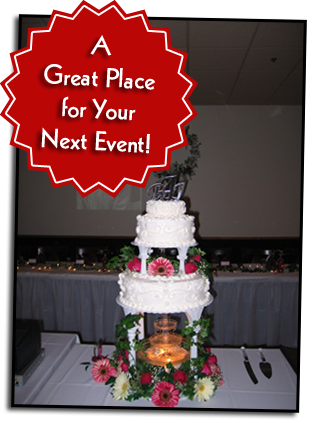 Plan your next event with Queen Bee’s. Call early to order your meal. Turkey, or Chicken, Mashed potatoes, Dressing, Vegetables, salads and Pies, all ready to serve. 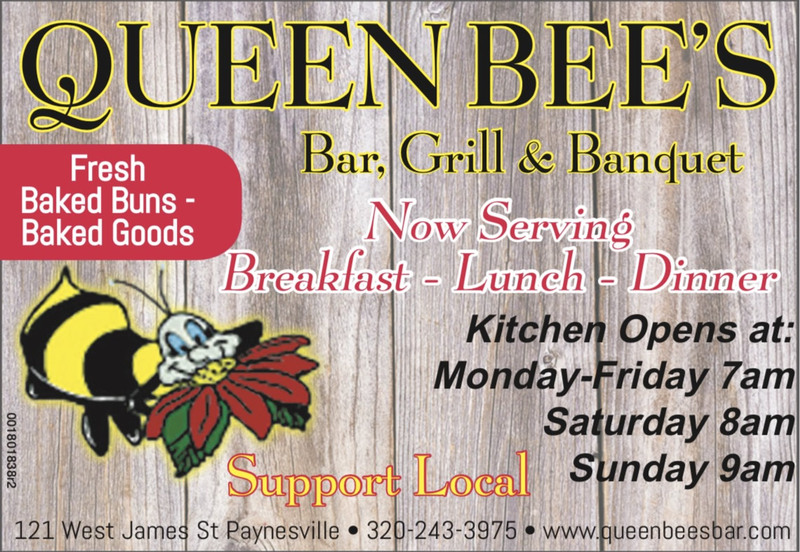 Queen Bee's Bar and Grill was established in 2000, by Tom and Doris Wendlandt. Tom and Doris were both locally born and always dreamed of having their own business. They have five children, whom all help at the restaurant. In 2006, another step was taken, knowing that they wanted to be a hot spot for weddings and other celebrations, they decided to completely remodel the building. 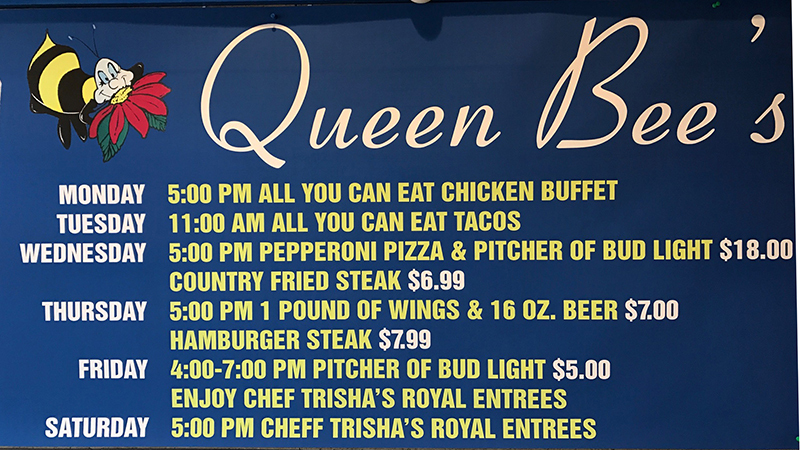 Queen Bee's Bar and Grill is now a central Minnesota favorite place for all occasions. In 2008, we hired Chef Trisha, Le Cordon Bleu graduate. 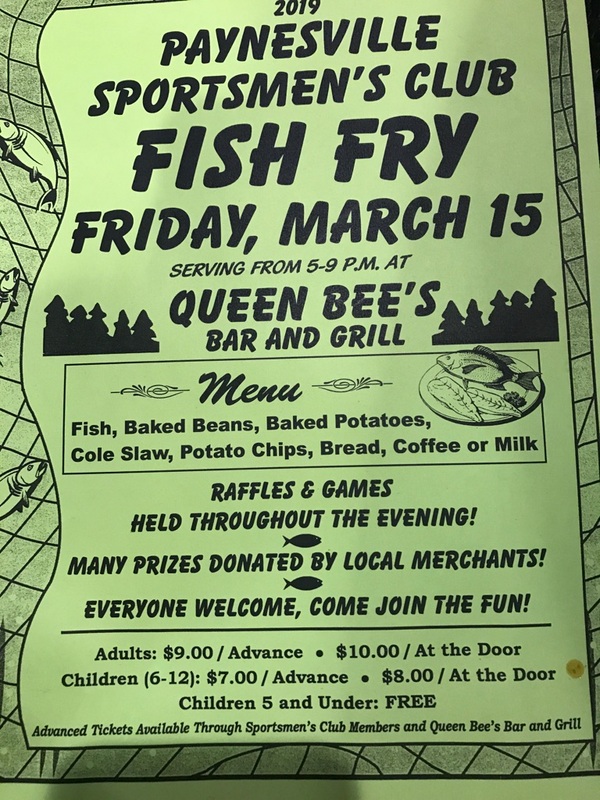 Queen Bee's invites you stop by and check out our family orientated business, and enjoy the small town prices with a big city atmosphere. When you walk into Queen Bee's, you become part of their family. Sunday - 11am - ?